This economy priced 5 FT. PLASTIC WALKING STAFF PROP is a magnificent addition, lending authenticity to any medieval themed Walking Dead inspired Zombie Hunter Halloween or ancient Bible character costume. Great prop for Christmas pageant, cosplay party or haunted house decoration. 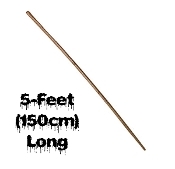 60-inch (150cm) Long Brown faux-wood grain detailed hollow molded plastic staff walking stick, comes in 3 pieces that are easy to assemble. Also makes an eerie Halloween haunted house decoration for your own magical forest! Perfect added touch for sorcerer, sorceress, witch or wizard costume. Halloween Cosplay Costume Prop Accessory for Steampunk Viking Warrior Barbarian Grim Reaper Voodoo Witch Doctor or Medieval Weapon Haunted House Decoration. Cheap economy theatrical prop for medieval role playing.